Concept #6 is a limited double deck arrangement. The focus is on the F&M (100′ mainline Strong to Bigelow) and the SRRR (75′ mainline Farmington to Phillips). The design focuses on simple early phases, and having a high duck-under at the entrance. That avoids the ceiling beams and heating ducts. The focus is on the SRRR (Farmington to Phillips) and the F&M (Strong to Bigelow). It reflects that modeling the P&R (Phillips to Rangeley) is not that important to me. This design puts Carrabassett and Bigelow on the upper deck over the top of Farmington. Bigelow has a good good room, but I’ll have to squeeze the approaching curve to fit my existing Free-mo module. There is room for the sawmill, but it must fit around the concrete column (holds up the fire place, can’t be moved). The 25′ of F&M over Farmington is ample to include Carrabassett and some other logging. Kingfield is on a stub, but a mirror imaged. An acceptable compromise possible because of the way the stairs shape the room. Salem and Starbirds are also represented. Strong is shaped as per the prototype. The rest of the middle of the room is available for Phillips and the P&R to Rangeley. The first two phases are great. Phase 1 is loop to Bigelow. Can be operated much like the real F&M. Would require 2-3 operators and 3-4 locos (something I can do today). Phase 2 would add Strong and Farmington. Initially, they could be operated as one mainline from Bigelow to Farmington. At this point in time, I’d have 4 of my 5 favorite locations (Bigelow, Kingfield, Strong, & Farmington). Phase 3 would add Phillips and possibly some more. It is the some more that is a challenge and discussed further in this post. The key grades are around the room to get from Farmington (40″) to Bigelow (60″). The 20″ difference gives room for benchwork on the top deck. The grade would be around 1.5% if the towns were on grade. Keeping the towns level, results in 1.5% to 3% grades. I set the stiffest grade of 2.9% between Starbirds and Salem, where the prototype had a 4% grade. The duck-under at the entrance to the room is a manageable clearance height of 50-52″. Even at 6’4″ tall, I can glide under when the duck-under is a wide 48″. One height concern is that Strong is only 44″ above the floor, and only 8″ above the high workbench I had planned there. Additionally there is a sink and the vent for my spray booth that I hoped would sit on top of the work bench. If strong were only 12″ wide, this might be manageable, but it is more likely to be 18-24″ at this location. This height is on the low end for a duck-under for F&M operators to reach the Strong turntable. In phase 3, the Phillips loop is to be replaced with a complete Phillips and some of the P&R north to Rangeley. I’ve drafted several options for that, but all of them are underwhelming. All of them get in Phillips, Madrid (or some middle location) and Rangeley. Having just two locations north of Phillips seems lame. 4-5 towns seems better, or maybe just a reversing loop (a reversing loop enable equipment to be reused as the prototype did). Maybe Madrid and a reversing loop would be optimal. Option 1 contains Phillips, Madrid, Rangeley, and a branch for logging. Similar to Option 1, Option 2 has a short logging branch. In both option 1&2, Madrid and Rangeley are close together adding to the “lame factor”. In both Phillips is well represented and has it’s proper curve to the right when approaching from Strong. Option 3 makes the best use of the space, has the longest run, and longest distance between locations. It does not support a logging branch as well. and worst of all, it flips Phillips around. It could be modeled prototypically, but trains would be entering the wrong end, or it could be modeled in mirror or some odd combination. All of the options suffer with a short run. There is no good place to have a reversing loop or staging. 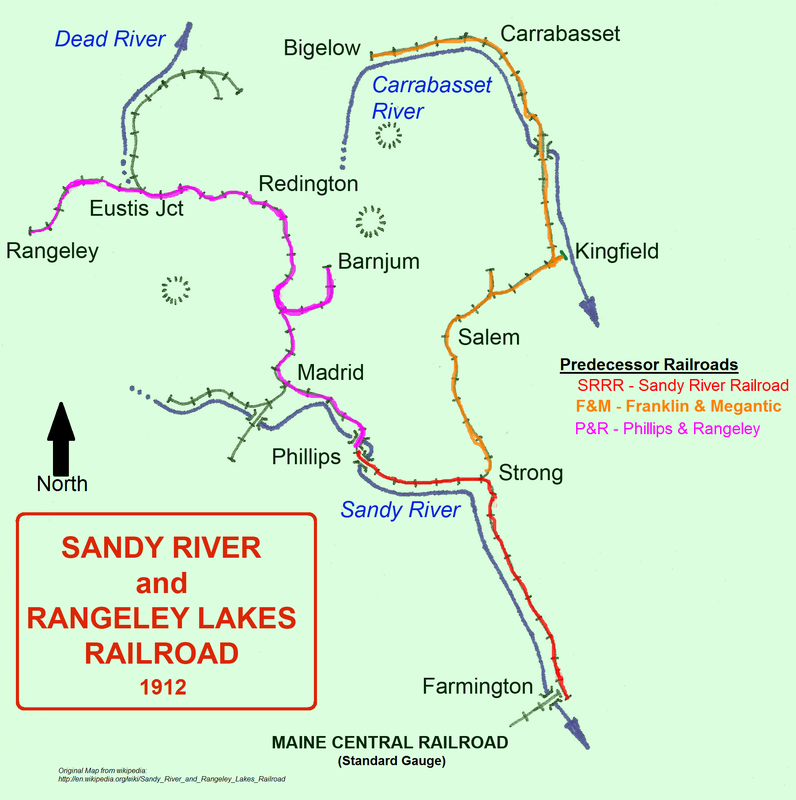 If the railroad terminates at Rangeley, then it can go uphill to obtain a better viewing height of say 53-55″ at Rangeley. This entry was posted in Layout Design, The Dream. Bookmark the permalink. Dave, that is alot of railroad… I think you are on the right track. Have you talked to John Rogers about the double decking, his version has several areas of multiple decks. I have operated on his layout twice now and you don’t notice the multiple decks. I have started the benchwork on my K&DR, following your trackplans. Most of the bench work for Kingfield is complete. The kingfield “island” has made a big difference of flow within the room. Yes, all concepts are “a lot of railroad”. Sn2 is a lot of crafstman work for track, structures, rolling stock, locomotives. Hence my strong desire to model in phases. I do not want to get in over my head. Mike Cougill at OST Publications has been blogging on “Freedom Layouts” I think the plan I designed for you is a freedom layout. My concepts are not freedom for my present life. But I think a phase could be! I’m querying all of my friends about deck heights. If all of my friends were 6’4″ tall like me, it would be a lot easier. There are 3-4 followup postings too. Additionally, I’m inspired by the work of Lance Mindheim and think his principals apply to a phase of a layout.